Exciting times - Cri-tech have started our site cut!!! Good news! 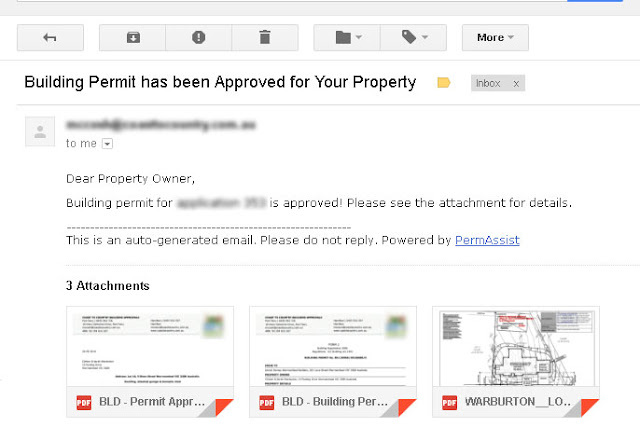 Our Building Permit has been approved for the house, garage and the shed! 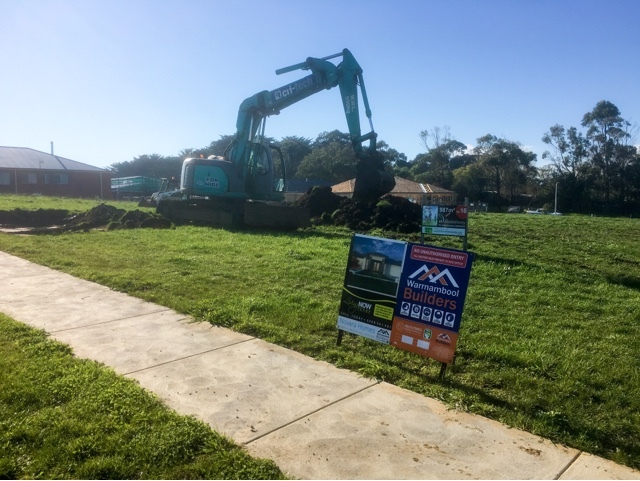 We did have a little speed bump along the way whereby the house got approved sans shed, because it was not included on the builders contract and therefore not covered by their warranty etc. Jarrod (the builder) has since helped us out big time by putting the shed through them as a Post Contract Variation - with a nominal (and very acceptable) cost to do so - in a continuation of a theme that thus far has them being exceptionally helpful! This is a big relief as I was always a little worried that we'd be told the shed was too big or too tall - or too close to the easement at the rear of the block - as it is the only change notated is that we need to put larger footings on the side adjacent to the easement - up to 450mm from 300mm. With any luck the cost change to this will be minimal as the concretors advised we would save ~$400 by doing the leveling of the site prior to their footing excavation - hopefully this goes some way to covering the increased footing size! Now we just have to wait for the go ahead from our financier - as well as get cracking on the block excavation. We met the builders for three hours today and signed our plans, specification and HIA building contract. There were a few adjustments to the drafts they'd sent through in the days prior but they were very accomodating in getting them resolved on paper prior to our attendance which was great. We also need to get our site cut/fill (excavation) work done - hopefully we can do something in that regard in the next weekend or two. One small hiccup I wasn't aware of is that the air con return air needs to be enlarged which will likely result in the powder room vanity moving slightly closer to the toilet and the pantry cabinets and shelving shrinking slightly. The sizes will still be fairly generous given the mammoth proportions of the main Kitchen (and we lose about 100mm of shelf width and 300mm of cabinet width - which is reasonably insignificant). 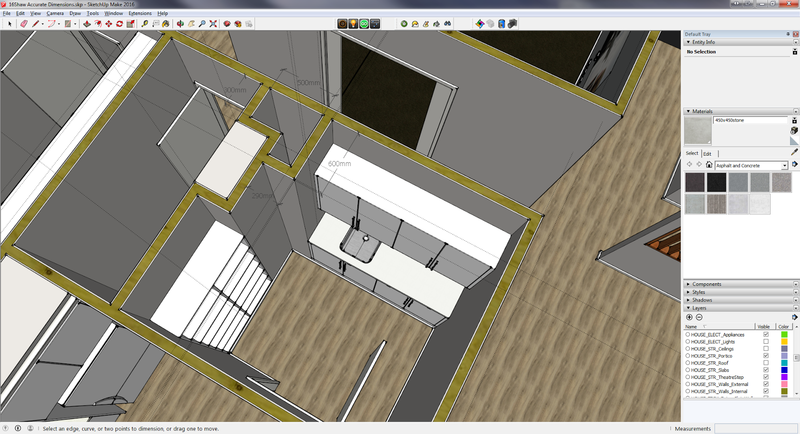 Overall the build is looking like being about 21% over our original budget. Not ideal, however better than the ~62% over budgets that we were originally estimated by other builders. Separated parents and kids "wings"
In the end the splashback window was too big to do double glazed so they're doing it in Low-E glass instead. 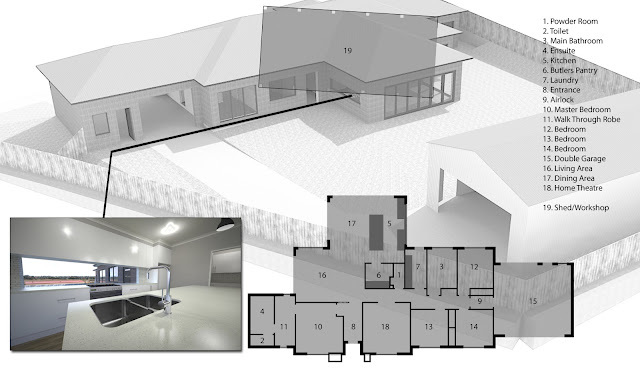 Now it's just a matter of getting the last few little bits and pieces done and all submitted to the bank for their approval *fingers crossed* - we had a pre-approval but our build cost has grown 21% - hopefully still OK. This will likely be the first post of many on the subject of home automation. You've been warned! I've been looking into retrofitting Z-Wave automation stuff over the last week or so and am convinced I'll be going down that path pretty early once we're in the house, certainly for some select lights/rooms and dimmers, especially the ones that I wanted on motion sensors that couldn't easily be done with conventional wiring (but would be easy enough with C-Bus or this Z-wave setup. For those that don't know, CBus is a whole wiring schema - in that all of your houses wiring - every switch, light, etc go back to a central unit that then controls the lot, allowing you to re-map any light switch to perform any function - turn on or off every light in the house, two lights, three, etc. The problem is it's a big up front cost and theres a fair bit of extra wiring length involved. The Z-wave/Zigbee type systems use a wireless mesh network - each module talks to the other and they spread their signal through the house by passing on each others signals - the modules can be put behind an existing light switch - the switch then signals the module, and the module turns the light on and off. This means the module itself can be controlled remotely - you need a central controller but then you can either use the light switch, or you can have a trigger- a timer, a motion sensor, a phone with a proximity sensor (i.e. outside lights turn on when you turn into the street) - you can also dim lights (and program the same)... tonight I walked around after the family and turned off 13 lights. I don't think a Z-wave system will take very long to pay for itself!! 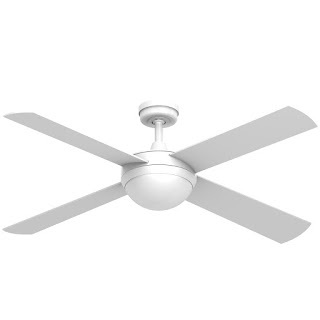 We need to pick ceiling fans -I'm pretty happy so far with the Hunter Pacific Intercept units - they get a pretty good write up on the ATA forums without being super expensive or styled in a way that will age. They also come with a 12w dimmable LED which will mean I can control the lights on them using a Z-wave dimmer. With any luck the same dimmer systems will be able to control whatever lights I choose to replace the standard batten fix. I'm also looking into relay switches (or using the same remote switch perhaps without the dimmer) to turn on the fans themselves - so they can be programmed to behave in a certain way depending on the temperature - to discourage use of the central heating/AC when the fan would suffice. What's also interesting is that these fans are pretty well what I've been using in the renders, by complete accident!